Refunded within 15 days of departure with all being left in good condition! 2 Bedroom 1 bath Lakefront Condo Main Floor Unit Available for Weekly Rental! This unit is an main level unit on the north side of building and on the west side of lake! 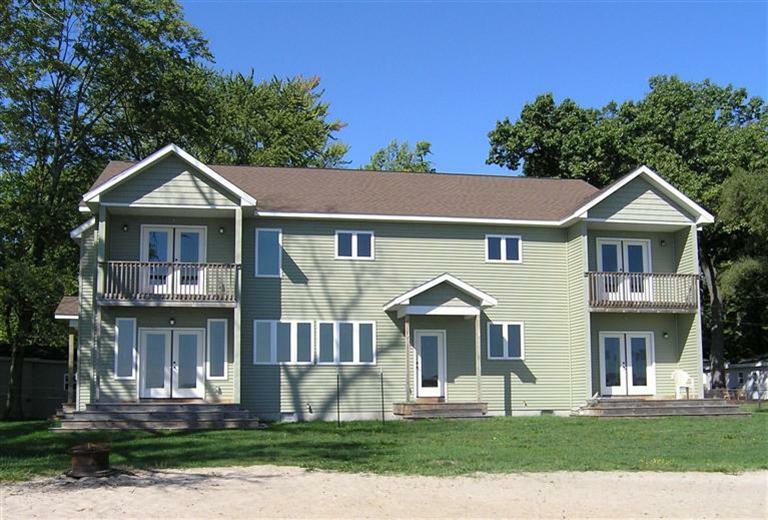 When sitting on deck, you would be facing east and looking across lake @ state park peninsula - 5 steps to get to unit! This unit is located within Whispering Pines Resort- Resort rules DO APPLY! This unit does not allow Pets! All Parking is assigned -2 spots per unit - yours will be along chain link fence- on north side of building - your spots are marked with the unit #. Additional parking for guest and boat trailers, along the split rail fence where there are no cottages facing the fence. Resort has play equipment - Beach Volley Ball Court -swim area & 200' of shared lake frontage! Each unit in the resort has 1 assigned boat slip. Be sure to let me know if you will be bringing or renting a boat during your stay! 1160sq. ft- fully furnished -full equipped kitchen - granite counter tops - toaster-blender-coffee maker-pots-pans-glass ware-silverware! All Units have Flat Panel TVS with basic Cable Service- WiFi -Community Beach Fire Pit! All Linens & Towels are prodived-Washer & Dryer- Central Air- Hardwood Floors! Gun Lake is a 2680 acre All Sports Lake located in the heart of the Yankee Springs Recreational Area. Easy access off US131 - halfway between Grand Rapids & Kalamazoo! There are lots of golf courses within 5 minutes of the lake- State Park and state land offers hiking-biking and snowmobile trails! New Gun Lake Casino just 10 miles from lake! Main Level Unit - Living Room -Open Floor Plan - Hardwood Floors! Queen Size Sofa Bed! 1 of 2 bed rooms- Queen Size bed. 2nd bedroom with 1 set of bunk beds! 2019 - This unit is a Flexible Day Check-In Rental! SAT. 8/31/19 -Labor Day -4 nite MIN. Available thru Off Season @ Short term lease $1500/month with a 3 Month Lease-Utilities included!